In 1939 Fonesca began to study architecture at the Universidad de la República Oriental del Uruguay (Montevideo). He left in 1942 to join the Taller Torres-Garcia. From that moment on, Fonseca turned to the study and implementation of the aesthetics promoted by Constructive Universalism and plunged into the comprehensive, humanistic and even ethical education that Joaquin Torres-Garcia proposed as a way of working directly and indirectly on a work of art. In 1944, along with other members of the workshop, he participated in the production of Saint Bois Hospital’s murals. In 1946 he traveled with a group of fellow students to Peru and Bolivia where he studied archaeology and pre-Columbian art. The paintings he produced at that time generally followed the precepts of Constructive Universalism (predominance of the structure, flat and symbolic shapes, color fields). Port scenes and still life paintings were his major output. At that time he also produced abstract wood reliefs. In 1949, Torres-Garcia’s death put an end to this stage of onesca’s career. The following year he left Uruguay. During the first half of the fifties, Fonseca lived in several European cities and traveled to the Middle East and North Africa. He visited several historical places and even worked at some archaeological sites. He studied ceramics in Madrid and Paris, went back to Montevideo in 1956 and finally settled in New York in 1958. Fonesca worked on several commissions for public spaces including a glass mosaic mural for the New School for Social Research (1959-1961). Throughout the sixties, the symbols, shapes, and grid structures characteristic of Constructive Universalism lost ground in his work to be overshadowed by the representation of a mysterious architecture that found its inspiration on the archaeological monuments he studied during his travels. The result was a series of metaphysical landscapes painted or embossed in wood or concrete. Over the years, these architectural forms transcended the plane becoming three-dimensional and settling into the real space. As a sort of intermediate stage, some works like Columbarium No. 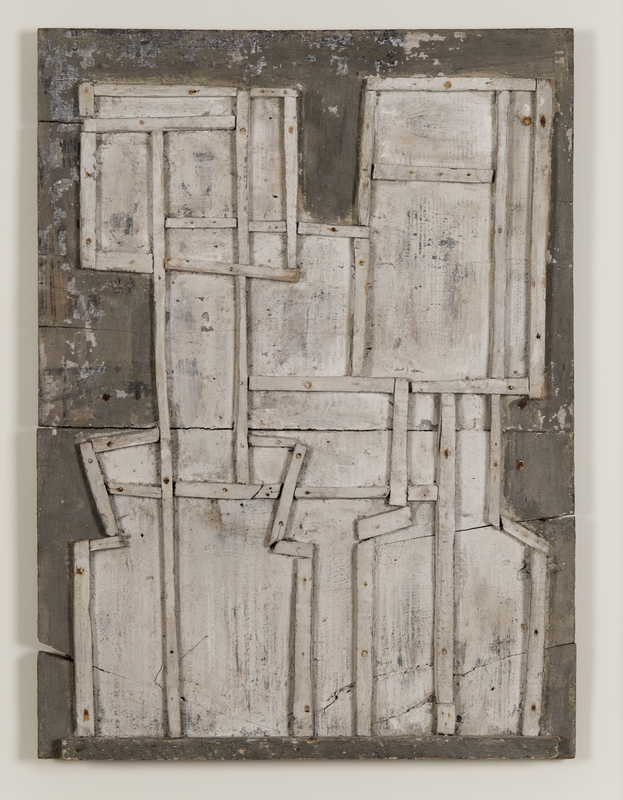 1, 1966 were conceived halfway between relief and assemblage. When commissioned new works for public spaces, such as The Sun Boat, Underpass and The Building in Reston (Virginia, United States, 1964-1965), and the Torre de los Vientos in Mexico City (1968), he produced great monuments that combined both sculpture and architecture. The Torre de los Vientos, a penetrable concrete tower that measures twelve meters high, was made for the sculpture park Ruta de la Amistad for the XIX Olympic Games. In the late sixties Fonseca made his first sculptures in stone, which thereafter became the main material for his artistic creation. He opened a workshop in Pietrasanta (near Carrara, Italy) and alternated between studios in Italy and the New York. Architectural shapes, inspired by the monuments of antiquity, continued to dominate his artwork but they were smaller than the works created in Reston and Mexico City. The new “architectures” could no longer be penetrated or traversed by the viewers, their dimensions were reduced, and their internal spaces while still implied had disappeared. The sculptures, full of metaphoric, symbolic, and mythical value, referred to sacred places (temples, mausoleums) with niches and altars that were empty or filled with objects of sacred appearance (typically geometric shapes). In some cases, a dialectic relationship was established among vertical forms (obelisks, towers, ziggurats) and horizontal ones (atriums, esplanades, terraces), and sometimes they recalled initiation rituals or rites of passage (porches, stairs, mazes, cavernous hollows). Using different types of stone (Carrara marble, limestone, red travertine, sandstone), Fonseca explored these findings and ideas for the duration of his career. He also produced a series of drawings, with similar motifs but more narrative in nature, featuring architectural buildings or landscapes inhabited by humans or mythological beings. Although his sculptural work was not to be well known in Uruguay until after his death, Fonseca represented his country of birth in the XLIV Venice Biennial (1990). Gonzalo Fonseca. Lanzarote: Fundación César Manrique, 1999. Gonzalo Fonseca. Sobre los muros. Montevideo: Roberto Sapriza, 2008. Mundos de Gonzalo Fonseca. Caracas: Museo de Bellas Artes, 1994. Recent Works. New York: The Jewish Museum, 1970.